Chris Froome (Team Sky) managed to drop his nemesis Alberto Contador (Tinkoff-Saxo) to win stage four of the 2015 Ruta Del Sol. The Briton also moves into the overall lead by a mere two seconds. 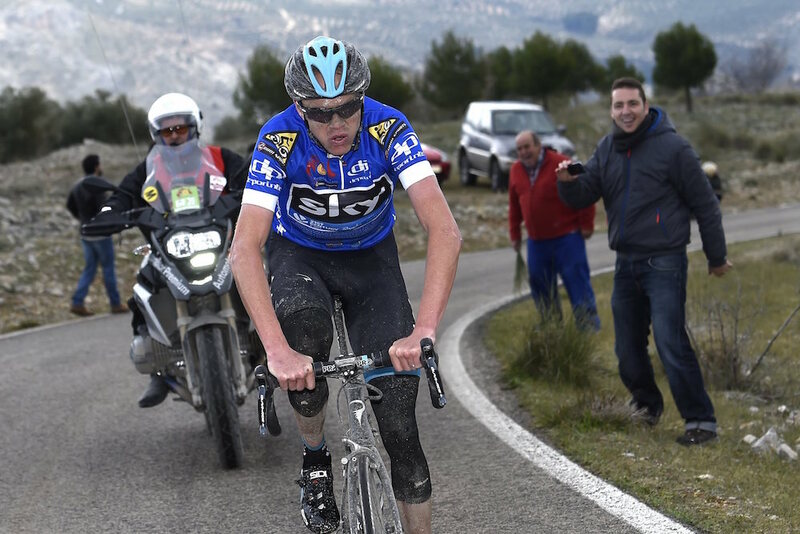 Froome unleashed his attack towards the top of the final climb to Alto de Allanadas, and Contador was initially the only rider in the bunch who managed to stick to his wheel. But Froome’s acceleration did not relent, and eventually the Spaniard cracked and was dropped, from which point on it became a case of damage limitation. The gap between the two continued to increase very gradually as the finish line approached, and Froome managed to gain the 28 seconds needed to take the leader’s jersey by the narrowest of margins. Earlier on the climb, Sky had worked over the peloton with Peter Kennaugh and Mikel Nieve each putting attacks in before Froome made his definitive move. Prior to the final climb, Simon Geschke (Giant-Alpecin) and Mirko Selvaggi (Wanty-Groupe Gobert) spent much of the day at the front and built a lead of several minutes over the peloton. After sticking to Geschke’s wheel without coming ahead to take a turn, Selvaggi attacked his breakway companion in the run-in to the final climb, but was himself caught by the bunch when Kennaugh was making his attack. Geschke and Selvaggi had broken clear of an original group of nine riders who formed the early break, including young British talent Hugh Carthy (Caja Rural). Tomorrow’s stage five is the last one of the race, and, despite the generally flat parcours, Froome will have to be alert to protect his slender lead in the GC.